If you’ve read the last two posts about stewardship and self-stewardship, I hope you agree that we should resurrect this old word, “stewardship,” as it provides a fantastic biblical paradigm for the Christian life. While taking seriously our responsibility of self-stewardship, we must always remember that it’s not ultimately about us. Our stewardship responsibilities do not end with ourselves, but with all those roles and responsibilities which God calls us to in the world around us. This great call of stewardship is all about love: loving God and, as an outflow of loving Him, loving others. Building on the definitions and foundational truths of the last two posts, this article’s goal is to help you take the next steps in serving your spheres of influence by creating further clarity around your specific roles and areas of responsibility: what I call spheres of stewardship. 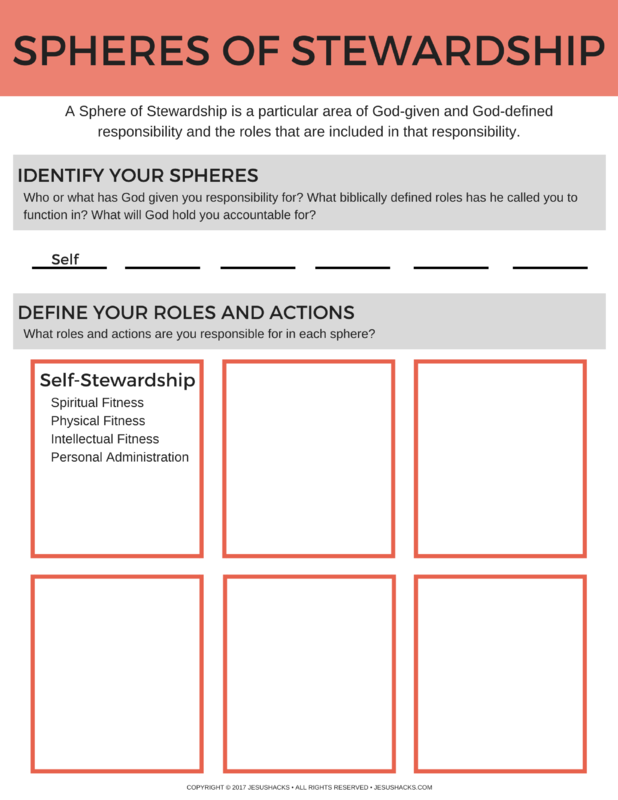 A Sphere of Stewardship is a particular area of God-given and God-defined responsibility and the roles that are included in that responsibility. For example, I have a family and therefore some of my primary roles and responsibilities in life are in the sphere of family. Within my stewardship sphere of family, I have the role of husband and father. If I didn’t have a family, I would not have this responsibility or role to steward well for God’s glory and the good of my wife and kids. Our God-given purpose to love, glorify and enjoy Him forever becomes more specific and personalized as we individually identify our spheres of stewardship. Though our overall purpose to love, glorify and enjoy God forever is the same for all of us, it looks different for each of us as it’s applied to our specific season and walk of life. This is often true of truth. Though it is absolute and the same for all people, in all places, at all times, it has many different applications. One interpretation, but many applications. My roles and responsibilities as a married man with 3 kids are different than those of a single woman who’s a digital nomad traveling the world. As Christians, our core purpose and identity in Christ is the same, but how that’s played out experientially every day in our spheres of stewardship looks different for each of us. Our responsibilities, roles, cultural contexts, experiences, commitments, passions, and so on all contribute to how God’s universal call and purpose for all Jesus-followers is applied in each person’s life individually. It is in this same way that we have one vision and ultimate purpose as stewards, but many contextualized applications of what we are to steward. Your job is to identify your current stewardship responsibilities and roles and allow God to define how you are to steward them. You do this by listening to Him through His word and talking to Him through prayer. You do this in order to discover how you can be a faithful and fruitful steward in every sphere of stewardship entrusted to you. Whether as a man or woman, single or married, an employee or employer, rich or poor; as a civilian or soldier, child or parent, follower or leader; As a friend, pastor, or mentor: What does the Bible call you to? How do the Scriptures instruct you to conduct yourself and steward your responsibilities well? Each sphere of stewardship needs to contain a mission. I like to make a very clear distinction between a mission and a goal. They are two different things, so we have to be careful not to mix them up. The mission provides you with an enduring aim you can look to as a guide to weigh your decisions and actions against. Goals, on the other hand, are better seen as objectives within the mission. The key to successful goal setting is to view them as milestones along the journey of the mission, and not as the mission or an end in themselves. Goals are a means to an end. There is one mission within a sphere of stewardship, but many goals. For example, a parenting mission statement might be to “raise kids who love and serve Jesus and others.” This mission states the aim of a huge journey that begins at each child’s birth until they are out of my direct care. A milestone, or goal, along that journey could be to serve at a local rescue mission so that they can experience being around the poor and serving those in need like Jesus did. This goal is different than the mission itself but serves the greater purposes of the mission and is in alignment with the overall mission. Goals can change from season to season depending on our context and circumstances but the mission remains the same no matter what because it is derived from God’s word. That being said, instead of trying to write an overall mission statement that tries to capture your entire life’s responsibilities and roles, take some time to write one-liner mission statements for each of your spheres of stewardship. These mission statements should communicate your aim and ambition in that particular sphere of stewardship as defined by the teachings of scripture. The mission statement becomes that reference point which can guide our decisions and actions in each sphere. With the Word of God at the center of our mission crafting for each sphere, we can be sure that the mission will remain relatively fixed. Though our understanding and articulation of the mission might be refined and tweaked over time, we can be sure that the mission remains the same in Scripture. As we dig in, discover, and articulate it for ourselves, we don’t have to worry about our mission changing frequently. The word of God teaches us about the framework He has given us to navigate life within. He hasn’t left us directionless to fend for ourselves but has given us a map that leads us to what really matters in life, both in the temporary and the eternal. Seeking to navigate life outside of the Creator’s framework and sphere of blessing will only lead to frustration and failure. Imagine setting your flight course from New York City for Sydney, Australia. If you’re just one degree off, you’d end up missing your destination by about 165 miles. This is why a map and framework are so important. They help keep you on the right track of effectively implementing your vision and core beliefs. Don’t get me wrong, there will be times when you find yourself off track and needing to correct your course, but that’s the exact reason why documenting your spheres of stewardship is so important and beneficial. As you begin your journey of identifying, defining and documenting your spheres of stewardship remember to ensure that they are aligned with God’s framework for life. My challenge for you is to build your life according to God’s framework, navigating life using His map. Unless God builds the house unless God draws the map, we labor in vain and our roadmap will lead us off course. Doing this exercise will provide clarity of direction and priorities. It gives you a referenceable roadmap for how to strategically spend your time and energy to achieve the mission God has called and assigned to you in each sphere. Upon completing this, I am confident that this will be one of the best exercises you’ve ever done. Remember, this is a process. You aren’t going to perfectly discover the roadmap or completely understand the framework overnight. It will be refined over time as God works in your life and you grow through time and experience. The key is to begin! When we zoom out and look at the big picture of our lives and begin giving it practical areas of applications we can begin to see more clearly how and where we can be loving God and loving people more intentionally and effectively. Definition and documentation bring clarity. It helps us apply what we know to be true. The key action then is to identify, define and write down your spheres of stewardship. Here are a few practicals to help you get started. What has God entrusted you with (e.g. time, energy, particular abilities or talents)? What responsibilities and roles do you currently have (e.g. marriage, family, personal, business, church)? Write these down into broad categories or “spheres” (e.g. Personal Self-Stewardship Responsibilities, Marriage and Family Responsibilities, Social Responsibilities, Church Responsibilities, Business Responsibilities). What roles and actions are you responsible for in each sphere? My own Personal Self-Stewardship Sphere of Stewardship contains actions like Spiritual and Physical Fitness, Personal Administration, and Intellectual Fitness. I also have a Marriage Sphere of Stewardship which contains activities like having a daily debrief to ensure focused time to share the day’s experiences, thoughts, and prayer requests together. It also contains goals like reading 1 marriage book per year together. No matter what your spheres are, you’ll have roles and responsibilities in them. Write those down so that you can begin to better understand what it will look like to live intentionally, lead effectively and leave a lasting legacy. Success! Now check your email to confirm your subscription and download your free worksheet!